Everything started from a previous production I did called Phat 2. This demo also featured an animation player like found in Phreaks, its principle was fast and easy to implement. Unfortunately, it was visually unpleasant because it was based on blocks - so resolution was quite big. Technically, each frames of animation were stored in a separate buffer. The texture data was actually a combination of PUSH BC, PUSH DE, PUSH HL, PUSH AF and EXX opcodes. Each frames were separately packed with Team Bomba's BitBuster V1.2 packer. Then the player itself running on Amstrad CPC was unpacking a frame of the animation and executing the opcodes to display it to the screen. While not being the best video I ever seen, I thought that the different animation steps in it could provide an interesting result. I knew I had to stick with it and focus on the best replay for the Amstrad CPC. I had to use a YouTube video downloader. The one I used is SaveVideoDownload, but I don't recommend it and I don't provide links as it seems to be the kind of browser extensions that do actually much more that it actually pretends - I suspect it to install spywares etc. Still, it did the job and got .mpg video of the whole video. Once I had the video, I had to use a bitmap extractor : for each frames of the .mpg video, I wished to get a list of .bmp files. I used VideoLAN Player (VLC) for that process. I don't remember the exact steps I did using the software, but I know I had to use tricky settings (and codecs ?) to get it working as expected - the only thing that matters here is to know that the process of bitmap extraction is possible with it. I did clean-ups in the frames - sorting between thousands of bitmaps is definitively a long process ! 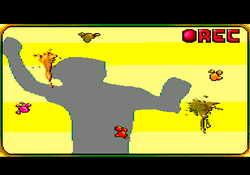 I then used IrfanViewer tool to reduce each frames to 2 colors and resize them to 768 x 205 resolution (which is my preferred "wide-screen" resolution for the CPC - here using video mode 2). Finally, I loaded each frames under Paint.net tool and added a blur effect on top of them. It was an important process because each frames have been resized and came from original MPEG compression, giving as sad consequence many artifacts around the character. This blur effect rounded the character. When the blur was applied, it unfortunately added new colors to the image, so once again I had to reduce the colors to 2 - all these steps have been done manually (no batch processes available in the tool for that), so it was really a quite painful process to accomplish (took me lots of time while needing lots of concentration and focus). I knew I ultimately wished a per-pixel based precision. So I quickly thought about using horizontal scanlines for storing my image data. For each lines of the image, I stored a list of X1 and X2 integer values (the edges of a line), describing horizontal lines. Once compressed with Exomizer, I got much better results than the previous algorithm - it ended to be 2 times better in term of memory usage, but still really slow at execution. Overflow - which has been a great support during all the process of the demo - advised me at this time to use pixel inversion. Using that trick, I only had X1 positions, X2 being a switch between pixel display on / off. While better memory-side, it was still too big in memory - about 30Kb for a single animation. I did many little tweaks in my data format to gain memory but it was definitely not ready for prime-time. Then there was that thing that everyone pointed me out after Phat 2 release : delta-packing. The process consists to display the first frame of the animation completely, then for the next frame only change pixel state for the ones that changed. To obtain this, I spent some times rewriting my tools to generate corresponding data. At this time I decided to switch back to a block-based effect a la Phat 2 for it. The result after 2 weeks of work was simply amazing : it was fast, and the same animation sequence I used from the beginning was under 17Kb. 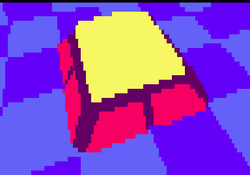 At this state of development, I realized I was able to store something like 2 times the content of Phat 2 demo in CPC memory ! Then I started to improve the current algorithm. I decided to use a special codification of all these blocks that were visually left plain or empty - let's say a group of blocks like 8x8 would actually be stored as a 1x1 block under a special unique identifier. For each frames, I also did a list of sprites that would be displayed around all the "blockish" character drawn on the screen. I introduced many tweaks to generate a better compressed data with Exomizer, and the results were quite convincing. The animation sequence that took 3 banks of RAM at the beginning now took 14Kb for the same visual - to me, that was impressive. This was the time where I clearly had the process of creating a demo based with this algorithm in mind. It was still based on Amstrad CPC's video mode 2. At this time, I noticed that Exomizer provided better results when dealing with a big, linear single buffer instead of multiple small ones. I wished to modify current Exomizer implementation to support source-buffer change on the fly. Think about the case where I have an animation sequence taking 30 Kb of memory when compressed, it could be nice to get that buffer stored inside the separate extended banks of RAM (which sizes 17Kb). I was discussing with Hicks/Vanity about my very special need concerning Exomizer, and he kindly agreed to write such a routine. Once received his work, and after some bug fixings, the routine was fully integrated into the demo. As planned, data was reduced even more so the initial 14Kb animation now took 11Kb ! On top of all this work I tried to introduce tile's horizontal/vertical swap. I had 2 bits somewhere when referencing a tile to get that info. It created smaller raw-data, unfortunately it ended as a worst compression from Exomizer than doing nothing. Also, I found out that all the code related in having a special treatment for full / empty blocks was less efficient than using a simple sprite for it, once compressed. It was good news memory-side, but I spent so many times tweaking this that I was disappointed having done so much work around it for... nothing. Finally, from the many tweaks I had to deal with, I found out that storing list of pixels ON/OFF was not efficient - I had better success in thinking with pixel reversions : if pixel is ON, then it gets OFF (and vice versa). I initially thought anti-alias support would be obvious for many people, but it seems that only few people really got the catch :) So it needs some explanations. So now the dirty secret : as described in this article, the effect is tile-based. It was not a random decision for me to use a width of 2 pixels for tiles. As a consequence, for an horizontal line of tile, there are 4 possible configurations : PIXEL OFF + PIXEL OFF, PIXEL ON + PIXEL OFF, PIXEL OFF + PIXEL ON, PIXEL ON + PIXEL ON. In Phreaks demo, it gets respectively translated to 0 + 0, 1 + 0, 0 + 1, 2 + 2 (0, 1 and 2 being palette indices). 1 + 0 and 0 + 1 are always used at begin / end of line. Think about it : it visually fakes an anti-alias effect ! Reverse-mode is the fact to display the animation with all pixels flipped horizontally. This trick adds some kind of variation to the visual effect. In Phreaks demo, this is accomplished by reversing all tiles horizontally (so basically, PIXEL ON + PIXEL OFF becomes PIXEL OFF + PIXEL ON, and PIXEL OFF + PIXEL ON becomes PIXEL ON + PIXEL OFF - which can be executed pretty fast thanks to using Amstrad CPC's video mode 0 !). Additionally to that, when displaying an horizontal line of tiles, the position has also to be reversed ("X = screenwidth - X"). In the end, it took me 4 months of work to get the animation sequence working as expected. It was quite exciting to think the ultimate data format was found, then finally coming back few days later with new, better ideas.